The following career opportunities are available with the City of Monroe. 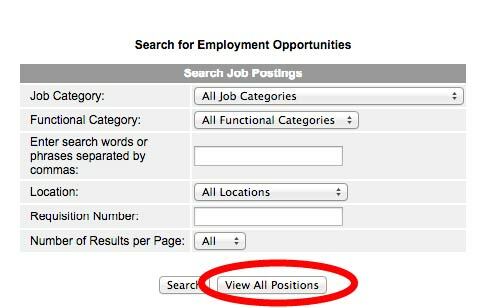 Applicants may apply online atwww.monroenc.org by selecting Employment Opportunities on the left side of the screen (See Diagram 1) and then selecting View All Positions (See Diagram 2) on the following page. In all city positions, the ability to speak Spanish is a plus. AFTER SCHOOL PROGRAM AIDE – Part-time position (Summer) 20-40 hours per week based on need and weekly Summer Camp enrollment. Will assist in providing Summer Camp program activities for participants that include games, swimming, crafts, sports and field trips. Assist in planning schedules, leading activities, and transporting children. Must be 18 years old. High school graduate or GED required. Must have the ability to organize and lead children ages 5 – 12. Prefer previous experience working with this age group in a day camp or day care setting. Valid NC Driver’s License (CDL preferred) with clean driving record required and ability to drive a 15 passenger van. First Aid/CPR certification required. Minimum starting salary $8.00 per hour with no benefits. For more information call Debbie Reynolds at 704-282-4649. BUILDING ATTENDANT – TEMPORARY POSITION – Located at the Winchester Center. Admit and supervise participants utilizing the facilities including: gym, game room, meeting room, and swimming pool; enforce facility rules and regulations and maintain order; collect user fees; assist with after school program; perform light custodial duties as required; answer telephone and assist callers or forward to appropriate personnel, and perform other related tasks as required. Must possess any combination of education and experience equivalent to graduation from high school. Hours: times and days vary due to program needs and rentals (weekend and evenings required). Weekly hours will be up to 19 hours. Salary is $9.00 per hour. For more information, please contact Ryan Jones at 704-282-4695. No Benefits. BUILDING INSPECTOR I, II OR III – The City of Monroe is seeking a Building Inspector Level I, II, or III to perform difficult technical work inspecting residential and commercial buildings for compliance with City ordinances and state building codes. Responsible for Level I, II, or III inspections of building, electrical, plumbing, mechanical, and fuel gas codes. Requires thorough knowledge of all types of building construction materials and methods, stages of construction when possible violations and defects may be most easily observed and corrected, and State building and related codes, laws, and ordinances. Must possess the ability to detect poor workmanship, inferior materials, and hazards of fire and collapse. Must have the ability to read and interpret plans, specifications, and blueprints accurately and to compare them with construction in process. Requires the ability to establish and maintain effective working relationships with building owners, contractors, and the general public, and use firmness and tact in enforcing ordinances and codes. Any combination of education and experience equivalent to graduation from high school and extensive experience in building inspection. Possession of an appropriate driver’s license valid in the State of North Carolina. Certifications at Level I, II, or III in building, mechanical, electrical, and plumbing fields as required by the North Carolina Code Officials Qualifications Board. Building Inspector I – grade 14, salary range $38,085 – $59,030. Building Inspector II – grade 16, salary range $42,037 – $65,125. Building Inspector III – grade 18, salary range $46,384 – $71,906. Apply online at www.monroenc.org and select Employment Opportunities. Supplemental assessment questions must be submitted with the application. EOE/Drug Free. ELECTRIC SUBSTATION TECHNICIAN I OR II – Perform skilled technical work in the installation, inspection, repair, and maintenance of electric substation equipment. Work outside normal hours in emergencies and perform on-call duties. Any combination of education and experience equivalent to graduation from high school, an Associate of Science Degree in Electrical or Electronics Engineering Technology or related field, and a minimum of two to five years’ experience. Possession of a valid commercial driver’s license valid in the state of residence (North Carolina or South Carolina) within six months of date of hire. CPR and basic first aid certification required. Must reside within a 30-mile radius of Downtown Monroe within six months of date of hire. Electric Substation Technician I: grade 16, salary range $42,037 – $65,125; Electric Substation Technician II: grade 17, salary range $44,158 – $68,432. Apply to City of Monroe online at www.monroenc.org and select Employment Opportunities. FACILITIES MAINTENANCE WORKER I – SEASONAL – Work in City parks and facilities picking up litter, emptying trash cans, and keeping outdoor restrooms clean. Will require weekend work to open and close parks for rentals. Requires possession of an appropriate driver’s license valid in the State of North Carolina. Salary $9.00 per hour; less than 20 hours per week. Apply online at www.monroenc.org and select Employment Opportunities. EOE/Drug Free. FACILITIES MAINTENANCE WORKER II – GOLF COURSE – SEASONAL – Up to 40 hours per week. Perform semi-skilled work in the maintenance and care of the golf course or grounds. Required to operate a variety of mowers and equipment in cutting grass to desired heights, trimming and related maintenance and upkeep functions at the golf course. Golf course irrigation experience preferred. Check equipment to ensure proper operation; perform some minor troubleshooting and maintenance on equipment. Valid NC driver’s license required. Salary $9.00 per hour. No benefits. For more information, please contact Scott Huss at 704-282-4660. Apply online at www.monroenc.org and select Employment Opportunities. EOE/Drug Free. LINE APPRENTICE I, LINE APPRENTICE II, OR JOURNEYMAN/LINEMAN – Perform construction and maintenance activities as required on an electrical distribution system including overhead, underground, substations and metering applications. Work is performed outdoors in all weather conditions. Any combination of education and experience equivalent to graduation from high school and minimum of two years’ experience in electrical distribution construction and/or maintenance. Certificate of completion of an approved apprentice program is a plus. Must reside within a 30-mile radius of Downtown Monroe, and possess a valid North Carolina or South Carolina CDL driver’s license or be able to obtain one within six months of date of hire. Line Apprentice I: grade 13, salary range $36,234 – $56,160; Line Apprentice II: grade 14, salary range $38,085 – $59,030; Journeyman/Lineman: grade 15, salary range $39,998 – $62,005. 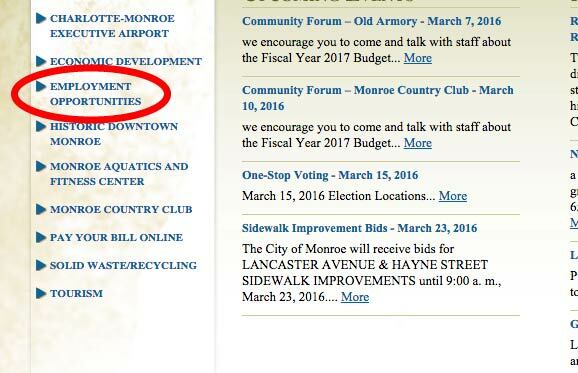 Apply to City of Monroe online at www.monroenc.org and select Employment Opportunities. LIFEGUARD – The City of Monroe is accepting applications for a part-time seasonal position from June – August. Hours vary Monday through Saturday between 9:00 a.m. – 6:00 p.m. Average weekly hours will be between 20 -25 hours based on programming needs. Salary: $7.75 per hour. Must have Lifeguard Certification. For more information, please contact Ryan Jones at 704-282-4695 or rjones@monroenc.org. Apply online at www.monroenc.org and select Employment Opportunities. EOE/Drug Free. POLICE INFORMATION CLERK – The City of Monroe is seeking someone to perform a variety of complex office assistance and administrative tasks; answer telephone and transfer to proper police personnel; operates a variety of electronic equipment; operates computers including DCI and CAD to receive confidential information; monitors police department security camera surveillance system and other tasks as required. Any combination of education and experience from high school to course work in secretarial science and considerable office assistance. DCI Certification is preferred. Requires working rotating shifts, nights, weekends, and holidays. Salary grade 11; salary range $32,802 – $50,856. Apply online at www.monroenc.org and select Employment Opportunities. EOE/Drug Free. STORMWATER MAINTENANCE WORKER II – Maintenance worker responsible for semi-skilled and unskilled tasks in new construction and maintenance of stormwater infrastructure. Must be able to operate light to medium equipment, including loaders, dump trucks, etc. Must have or be able to obtain valid Class B CDL within six (6) months of hire. Salary grade 7; minimum starting salary $26,957. Apply online at www.monroenc.org and select Employment Opportunities. EOE/Drug Free. WATER RESOURCES TREATMENT PLANT MAINTENANCE MECHANIC I – The City of Monroe is seeking a skilled maintenance person to join the electrical/instrumentation/mechanical maintenance team in the City’s Water Resources Department. The successful candidate will have knowledge of standard practices, methods, tools, and materials of the electrical and mechanical trades; general knowledge of the occupational hazards connected with water and sewer equipment maintenance, and have experience with mechanical equipment including pumps, motors, valves, piping, chemical feed systems, etc., and a strong electrical controls background. Experience with welding, computerized control systems, and a computerized maintenance work order system is also desired. Salary grade 12; salary range: $34,445 – $53,456. Apply online at www.monroenc.org and select Employment Opportunities. EOE/Drug Free.